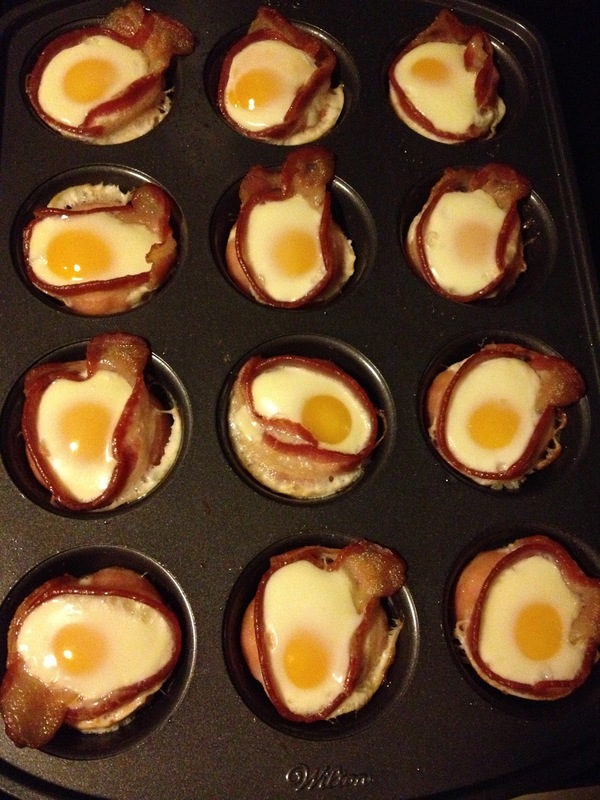 Surely everyone knows how to make these Bacon and Egg Cups by now? Just in case, here’s a blast from he past, 2012 to be exact. Cassie was concerned about Ger buying boiled eggs at the grocery when he was in too much of a hurry to cook his own here. (not the best eggs…..how long have they been sitting there…..) so we all started making these. There are so many variations, too. They’re all over Pinterest. You won’t find any of us making them with turkey bacon though – lol! So, it’s a cool idea. All you do is line your muffin cups with uncured bacon. Than, you crack an egg into each one. Sea salt and freshly ground pepper go on the top. Put them in a 350 degree oven for 20-25 minutes. Some people rub the muffin tin with coconut oil first, but it seems that with the bacon grease, you really don’t need to do it. Some people stir up the eggs in a bowl first, and add baby spinach or diced red pepper or fresh basil. It all works. They are a great way to plan ahead, so you can throw them on a paper plate and into the microwave for a few seconds before running out the door. They aren’t bad cold, either! (I never nuke anything now) Mine are in a gallon Ziploc bag in the fridge, but you know they won’t last long.